I'm fascinated by the Lutheran understanding of vocation. One of the best examples of vocational living is my friend, Peg Armstrong-Gustafson. She recently received the Great Samaritan Award from our local Thrivent Chapter. Here are the comments that were shared by Ruth Hiddleson at the awards presentation. 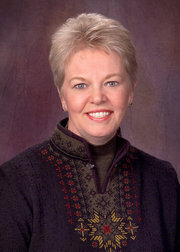 Peg Armstrong-Gustafson grew up in northeast Iowa near Decorah. She was active in Future Farmers of America (FFA), elected state FFA reporter in 1975; later becoming the first woman state president and in 1977 became National FFA vice president and subsequently the National FFA president. Another reason for liking FFA, she met her husband Gregg through FFA. He was a district officer from Northwest Iowa. The couple has a daughter Alex, a student at ISU. She attended Iowa State University where she earned a degree in animal science.Peg went on to graduate with an MBA from Drake University and has also studied international finance at City University in London. Although she has strong ties to Iowa, she is anything but tied down, having traveled to locations all over the world including Greece, Italy, England, Thailand, Chile, Argentina, Brazil, Turkey and North and South Viet Nam. With her enthusiasm for overseas travel and interest in cultures worldwide, it’s not surprising to learn that Peg’s business has a global purpose. She is the founder of Amson Technology, LC, which provides consulting services in climate change, sustainability and carbon offsets. Peg’s vision – and the vision of Amson Technology – is to alleviate world hunger through the sharing and application of technology to create a new sustainable agricultural footprint. Two summers ago, the UN gave approval for the broad application of this methodology – the first agricultural climate change methodology in the world. As part of the Kyoto Protocol, which industrialized countries have signed as a commitment to reduce their emissions of greenhouse gases, it is a historic accomplishment in the area of climate change. “Plants are the one thing that take carbon out of the air,” said Peg. “The UN’s decision highlights how agriculture can provide solutions to climate change issues while feeding a growing world population. While this initiative helps with climate change, the greatest value is that I am able to take agricultural technology to parts of the world that are starving and hopefully help them grow more food to feed themselves. That is my goal. We work with the Lutheran World Relief workers on the ground in Africa. They have the network of farmers that we need. The UN mandated that the carbon reduction systems go to third world countries. This is very important as the people in these countries get access to technology that they would never be able to pay for. The key is we are taking these methods to parts of Africa where the people can be helped. It’s a mutually beneficial project. The methodology teaches farmers better use of their water and land, which leads to increased crop yields, which leads to a higher caloric intake for the people in these communities. Extra food that is not consumed can then be sold into the market place which helps improve their economic position. It is an environmentally and economically sensible model. The long term goal of the project is to see the new technology expand beyond the borders of the project and be adopted by all farmers to create a more sustainable and productive farming operation!" Who says one person doesn’t make a difference?